The guys over at CareersBooster.com know how to make themselves noticed. The way they designed their website showcases their approach to work perfectly. As soon as you visit them you’ll be greeted by their best-selling packages, highest rated writers, advantages to choose their service, and their motto “Your potential is untapped, allow us to showcase it for you”. The presentation is great, and above all, the delivery time on your resume is just 24 hours. What else could you want more from a resume writing service? Quality, of course. Their pricing is standard and not obnoxiously expensive. As this review is written, some packages are discounted and you don’t even need a discount code to take advantage of this. They do however also use the discount code system, where you can insert one and get your product for cheaper. 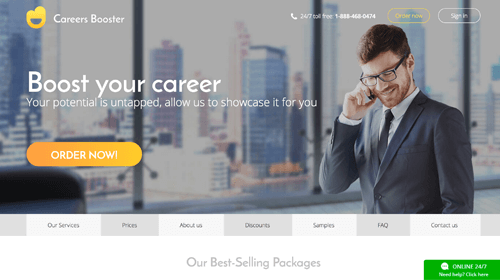 Prices are well suited for the quality CareersBooster.com provide. To make a payment all you need is a credit or debit card and a little patience. It’s super easy and they accept a wide variety of cards: Visa, MasterCard, Maestro, and a few others. 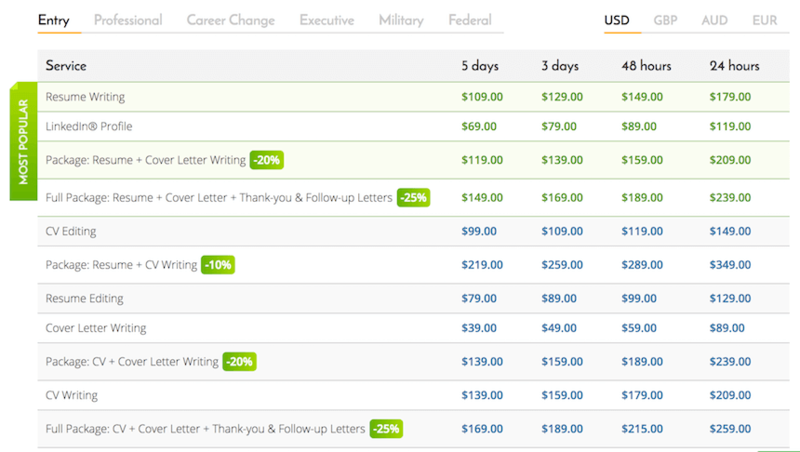 Delivery is super quick as you can select to receive your resume in only 24 hours, if needed. Standard is 5 days but you can also go for 3 or 2 days, it’s up to the customer. The service they provide is flawless. Everything is easy and fluid. They always deliver on time so there’s little to no worries to be had. Customer service is always there to help you in case you need it, and the Live chat agent that greets you when you visit the website is there as well. The best usage of the Live chat agent is to chat with him before you place an order so that every detail is clear from the start. If we’re talking about usability, then the guys over at CareersBooster.com covered this subject up greatly. Their website is friendly and information is very easy to find, the payment process goes smoothly and selecting your package is also intuitive since the whole website was built to well. A resume and cover letter were ordered in order to check for the quality and if they deliver on time. I went for the entry level package that went for $119 and besides the resume and the cover letter I also received unlimited revisions and direct contact with the writer. Hopefully, no revisions were needed, but I did take the opportunity to chat directly with the writer assigned to write my task. The way he talked emitted professionalism and the whole experience was pleasant. I received my paper a few hours before the set deadline and went on checking its quality. There were no grammar mistakes, no sentences that didn’t make sense, and no missing letters. It was clear that the resume was written by an expert English speaker. The overall quality of the text was also great and worth the price. All the CareersBooster reviews I’ve read were not telling lies after all.